Note: I have written about this alternate history in other threads, which I will update and move here eventually. 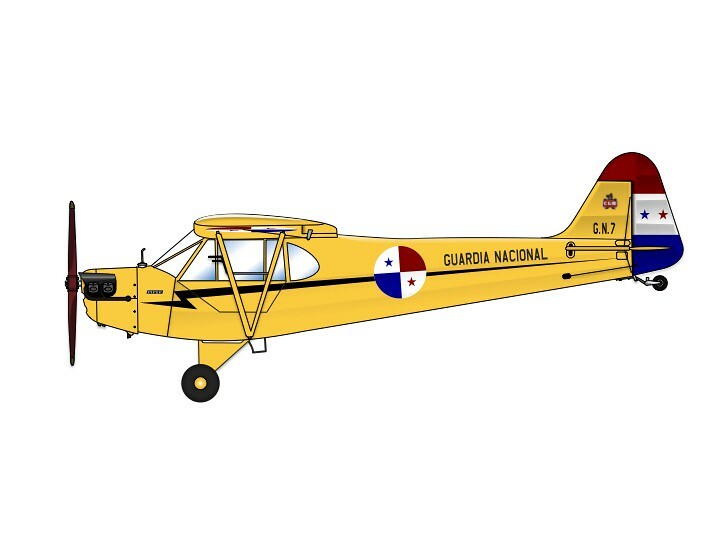 Prior to 1940, the total inventory of the Guardia Nacional del Aire consisted of a single Piper J3f-65 Cub, which was joined in 1941 by a Luscombe 8A Silvaire (both of which are shown below). Under the influence of the National Revolutionary Party led by Arnulfo Arias Madrid and his brother Harmodio, the Panamanian government leaned more and more toward Nazi Germany as a counterbalance against the powerful influence of the United States. In 1940, at his inauguration as president of Panama, Arnulfo Arias said, “As Panama has ceded its territory to the United States to construct the Canal, Panama also can cede territory to the Germany of Adolf Hitler so they can construct here what they wish and can help us against Imperialism." By December, he had negotiated to do just that – the Germans agreed to build a U-Boat station at Bocas Del Toro in the northwestern portion of Panama. In preparation for the work, German engineers arrived in January 1941, and in February, 1941, they were joined, (at Arias’ request) by a small military contingent to provide defense. 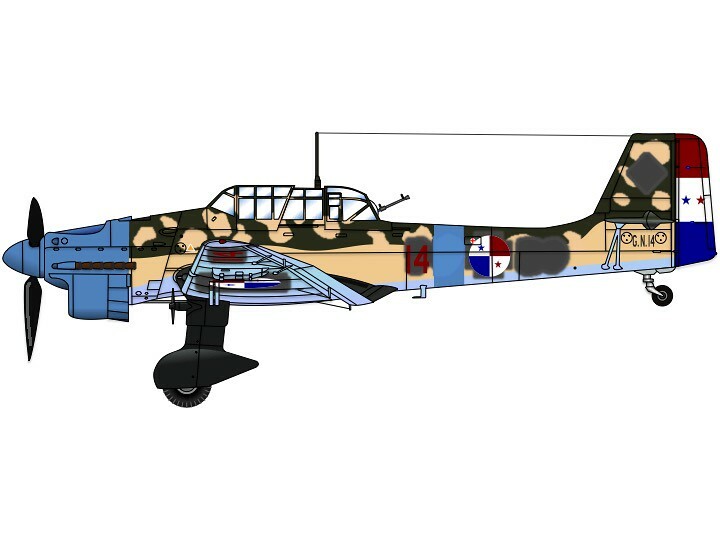 This military contingent was symbolic in the extreme, and consisted of a company of infantry supported by a small composite air unit with six Bf 109E-7Trop fighters, 6 Ju 87B-2Trop dive bombers, and 6 Hs 126 observation aircraft, and one Ju 52/3m/See. 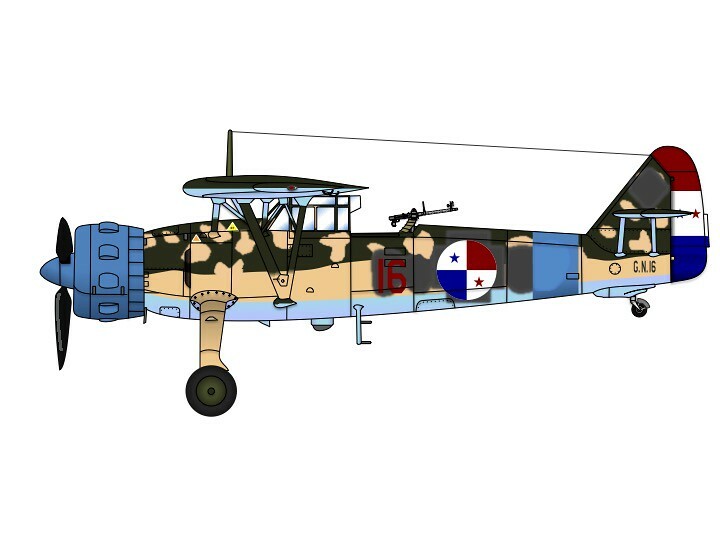 The blue theater recognition markings on the German aircraft led to them being nicknamed ‘Las Narices Azules’ by the Panamanians. Physical work on the U-boat station had barely begun when circumstances ended the effort. 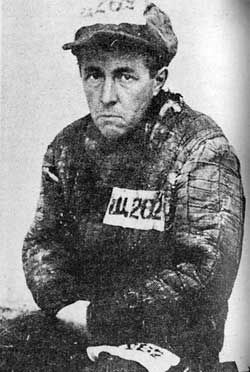 Arias was deposed in October 1941, and replaced by a much more pro-US (and anti-Nazi) regime. Soon after, the Pearl Harbor attack propelled Panama into the war on the Allied side. Upon the Panamanian declaration of war on Germany on December 13, 1941, the Luftwaffe personnel attempted to burn their aircraft to prevent them from falling into Allied hands. 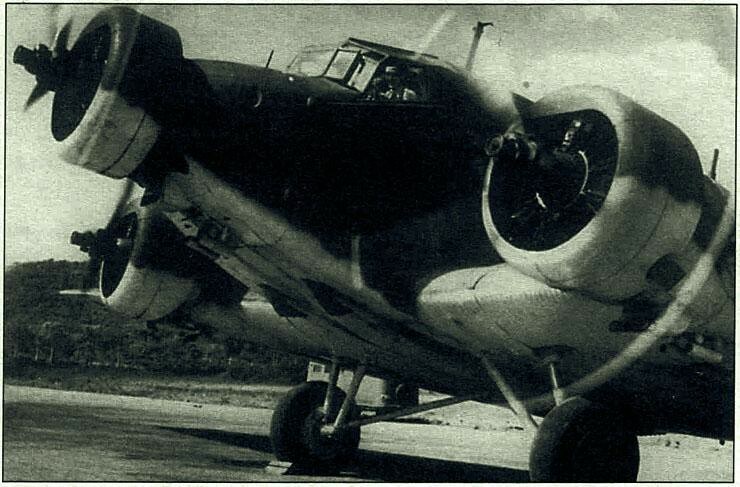 However, several of them survived the attempt and were made airworthy to serve the Guardia Nacional del Aire. Four Bf-109s, two Ju 87s, five Henschels, and the solitary Ju 52 were all made airwarthy and taken on charge by the Guardia Nacional. German markings were painted over and Panamanian markings took their place, but the blue theater markings and German camouflage remained. Service was short, due to lack of spares and other support. 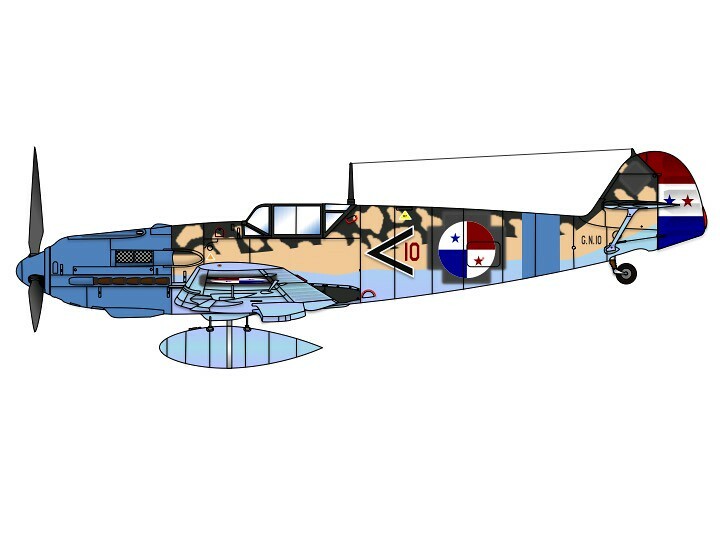 Moreover, the Guardia Nacional lacked pilots with sufficient training to fly these high-performance aircraft; the quartet of Messerschmitts in particular suffered rapid attrition. But for a brief few months, Panama had one of the most advanced air arms in Latin America (at least on paper). The last two surviving Messerschmitts were turned over to the US Army Air Force in November, 1942 as a condition for the supply of American aircraft under the lend-lease program, deliveries of which began with Fairchild PT-19A trainers, ten of which were supplied. The Stukas were also out of service by the end of 1942, both having crashed due to pilot error. The Henschels lasted longer, as they were relatively easy to fly and maintain and proved useful for coastal patrol work. In the fall of 1942, the useful and well-liked Henschels were suffering from unserviceability of their Bramo engines, and so an update program was put in place. A team from EDO Aircraft Corporation, aided by representatives from Curtiss-Wright, designed an installation for the 975 hp Wright R-1820 engine. At the same time, the airframes were overhauled and EDO floats were installed in place of the Henschel’s fixed landing gear. This made the Henschels even more useful to the Panamanians, and they remained in service until 1947. 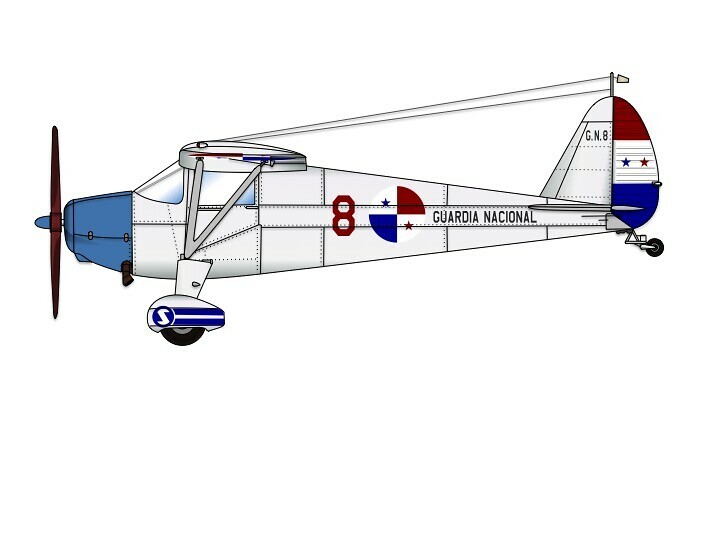 The upgraded Hs 126s, nicknamed Gaviotas by the Guardia Nacional, flew their first anti-submarine patrol in January, 1943. Though the U-boat threat was nearing an end in the Caribbean, patrols continued until the end of the war. The Gaviotas’ claim to fame, and indeed, that of the Guardia Nacional, came in March of 1943, when Hs 126 GN16 spotted a submerged submarine off the coast near Palmas Bellas. The crew of GN16 called for assistance, but fearing the U-boat would escape before help arrived, attacked with their single Mk 17 depth bomb. Their attack damaged the U-boat, which was forced to surface. The U-boat crew attempted to fight off its attacker, but GN16 maintained a safe distance until a USAAF B-18B arrived from nearby France Field. At this point, the crew scuttled the U-boat and was eventually rescued/captured by Panamanian Coast Guard vessels. Good story and remarkably close to reality! 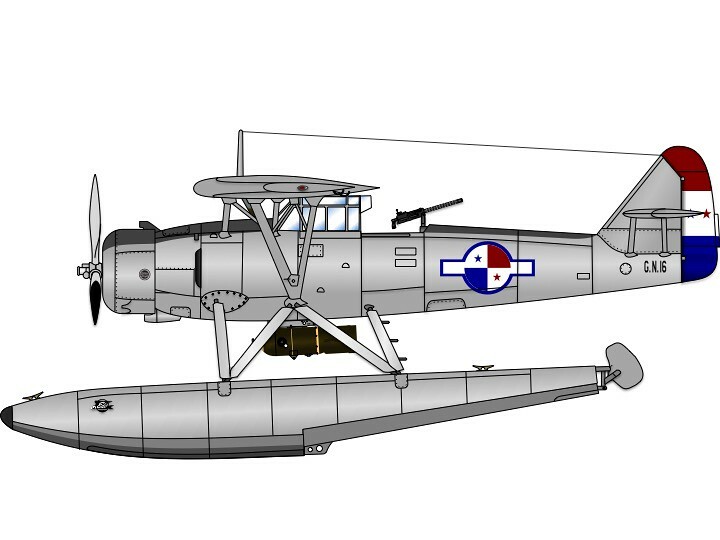 The Henschel floatplane reminds me of a Blackburn Shark. IIRC, there was a Ju-52 in Panama that was commandeered by the USAAF and fitted with T-6 engines and cowlings. 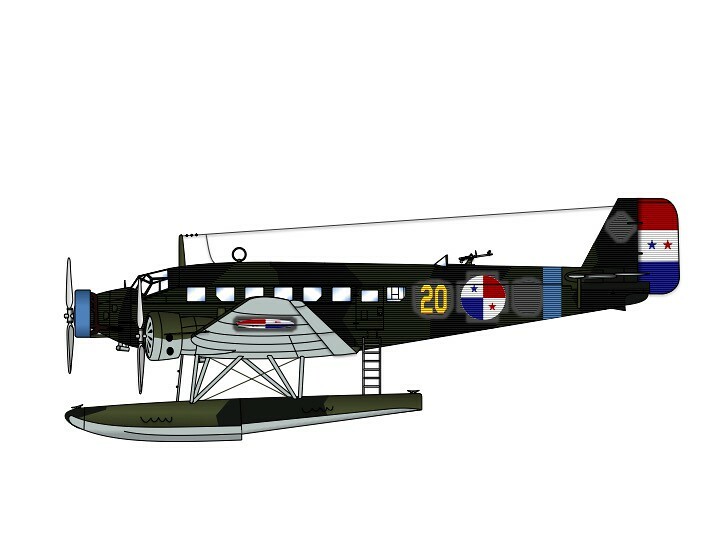 There were several Ju 52s in real-world Latin American military service. The one you are referring to was impressed by the USAAF in Panama and designated C-79. 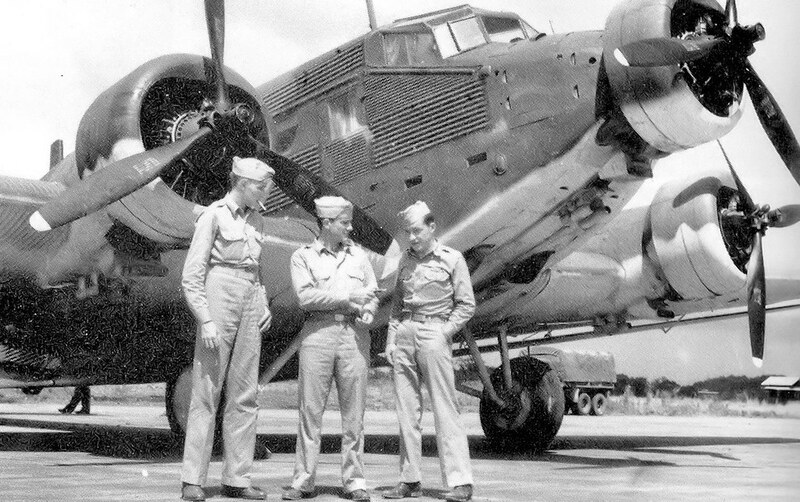 It got R-1690 Hornets and modified DC-2s cowling, a tailwheel in place of skid, and US radio and other equipment. I'll post a pic later. Wonder how the engine parts from a B-17 would look on the Monogram Ju-52. Thanks, Chris. I think you meant to say "THE other C-79 pic" as these two seem to be the only ones in existence. It is certainly doable to model the C-79 in plastic, but perhaps not worth the expense. If you are trying to complete a collection of USAAC/USAAF/USAAF transports, or some such collection, it could be worthwhile. People keep mentioning the T-6, but you really need a different cowl/engine/propeller combo. DC-2 would be the best bet, but something else might work. Very early B-17 (e.g., B-17B) would probably be ideal. Then you could fit the B-17 remains with some cool inline to make an earlier version of the beautiful XB-38! Yes, that's what I meant, as there was only the single C-79. The cowlings on the C-79 look very similar to those on early B-18's.